UP5_6, an unrivalled icon of Italian design on the international stage, now presented in an unusual version designed for children aged over 3 years: UPJ. 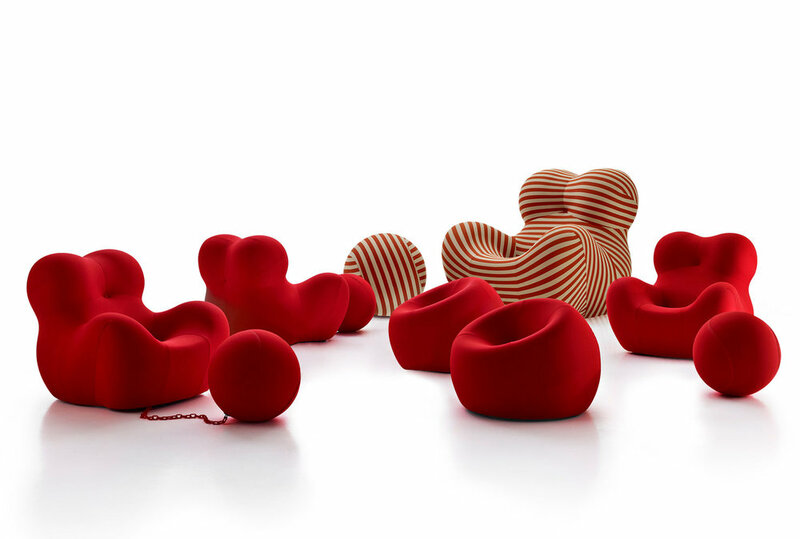 ...The new Junior version, which is identical to the original except for being smaller in size, is proposed as a design armchair both comfortable and playful; its attractive shape and its bright red colour will tastefully furnish and enhance spaces dedicated to children and even compact metropolitan apartments. UPJ, the latest “must” for all those who will not give up a seat - even a small one - that has a place in design history. Technical information Frame: Bayfit® (Bayer®) flexible cold shaped polyurethane foam Cover: fabric in limited categories Cover button: metallic base, 100% polyester fabric Cover cord: 100% nylon Bottom base: 100% jute fabric, black PVC trimming Bottom base button: thick leather Connection chain: plastic material Elements for chain fixing: plastic material ATTENTION The product is not suitable for children under 36 months.